So Cormac McCarthy is selling his typewriter. Traditionalists need not fear: he's replacing it with another one. The retired machine, bought circa 1963, has just got a bit worn down after almost half a century of clacking away, churning out a dozen novels and a sheaf of other works. I know exactly what DeLillo means about the sound of the keys. 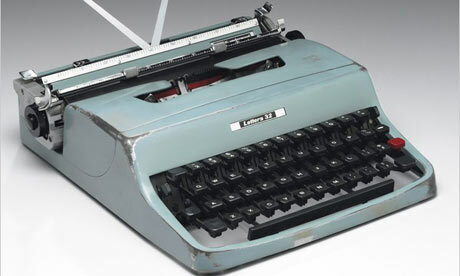 The photo of McCarthy's trusty Olivetti reminded me of my mother's Hermes Rocket, another slim but sturdy portable whose keyboard I gleefully bashed away at long before I knew how to actually read or write. I remember exactly how satisfying it felt to hear the clickety-clack and see the letters marching across the page. Who cared if they made words? "Sandy the Sandpail had a friend called Goldie. Nothing happened to Goldie." Obviously, the use of the typewriter has influenced the elliptical style that Cormac McCarthy and I share.